Great new logo - finally, something that fits the intentions of the board. I was telling Nik last night that I've tweaked Lance Weakland's version of the Hours so it works best for me. As I don't use Sext, rather than use the kathismata scheme for the psalms, which he has broken down among three hours (Prime, Sext and Little Compline), I use the arrangement of the psalms for morning and evening prayer as found in the psalter I use - the Anglican Book of Common Prayer (either English 1662 or American 1928 will work). It works. With this system, rather than repeating the same selection of psalms, you go through the whole psalter in a month. So, can I have some tahini with my falafel? That looks real tasty. Tell me more. Leave it to Oc.net to bring up delicious food during/the day before a fast. Nothing like hermetically sealing together disparate insanities. Well, falafel is basically a ball made of fried herbs, fava beans, and chick peas. And tahini is made of sesame seeds. They are both lenten and can be eaten during fasts. Not with all that oil. ^That's not a meatball. It's falafel. I thought the burrito was the falafel? It's easy to confuse a falafel with other things... just ask Bill O'Reilly. No, falafel is a beanball, for lack of a better word. It's normally put in the pocket of pita loaf with vegetables and a sauce. Falafel is basically a ball made of fried herbs, fava beans, and chick peas. And tahini is made of sesame seeds. They are both lenten and can be eaten during fasts. 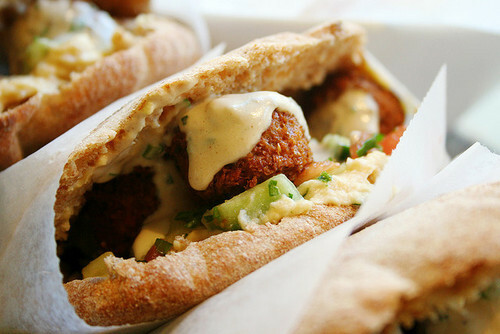 You ought to bake your falafel in order to have it be more appropriate. "The Bean Bible" by Alicia Green contains recipes for both both baked and fried falafels, as the author is jewish, she knows what makes a good falafel. This cookbook contains numerous excellent vegetarian bean recipes full of protein and nutrition. Some of them require omission of extra oil, meat/broth/dairy additions suggested in the recipes, however, this is easy to correct. It is also notable for having recipes that come from a wide range of cultures, though the majority are western european, several are latin american, carribean and middle eastern. At this time of year you ought to find some fresh fava bean to shell from the pods to eat with some fresh herbs and salt or vinegar instead. Some of the korean and middle eastern markets also sell fresh chick peas, one of the best fresh beans I've ever had. A large roasted Jerusalem chickpea is even tastier than a large roasted Virginia peanut. Fasnachts were made as a way to empty the pantry of lard, sugar, fat, and butter, which were traditionally fasted from during Lent. I hate to bring this thread back on topic, I was enjoying the falafel talk! But I have a question related to the Hours. What is the difference between the Monastic Diurnal and Anglican Breviary? I'm trying to find a great source for praying the Hours. The Anglican Breviary is the Roman secular Office with some...oddly distorted editing of the Saints lives. The Monastic Diurnal is the Benedictine Day Hours beginning with Lauds. The Monastic Breviary Matins is the "big" Benedictine Office of readings and complements the Diurnal. The secular Office and the Benedictine Office are not the same, mostly because of a radical "reform" of the secular Office in the time of Pius X. For the Benedictine Offices the Monastic Diurnal and Breviary Matins are what the Benedictines have always used, and the ones from Lancelot Andrewes are beautiful and worth every penny. Thank you Sleeper for the explanation! What sort of edits were made in the Anglican Breviary? Mostly stuff like, "Legend has it that such-and-such happened, but that is obviously not true..."
As marvelous as the Monastic Breviary matins is, it does not contain those saints, even though the matins lessons it does contain are superior translations. Thats the best thing about Monastic Breviary Matins, for the lessons I have never found as good latin translations into english as that book, they are as good and as profound as any readings from the byzantine office. Yet I do wish it could have been more complete in it's proper of the saints. I have been using that, but with the book "A Psalter for prayer" by David James for the psalms due to it being a scholarly Orthodox translation of the same anglican psalter which corrects several mistakes. If I were you I would use the the three monastic diurnal books for the most part, if you want convenience, beautiful music, the most of the tradition in one place accessible in english thats the best balance. I would probably supplement it with a Roman secular Office book so as to complete the missing proper of the Saints . I say that because I am very interested in the lives of saints, and don't know why anyone else wouldnt be, the more the merrier. So I would print out the proper of the saints from the google book roman breviary and use it in conjunction with the Monastic Diurnal books. You can read most of that site for free if you are clever. That is an easy way to access most of the roman breviary. this company is selling a 6000 page roman breviary from 1963 if I recall, reprinted. More copies will be available within the next three monthes. They sell out fast. When William Renwick completes his 1534 Sarum use office breviary/portiforium it is going to resolve that issue, having all the music and lessons of all the divine office unified in about 5 volumes of a single set of books (1000 pages each), taking up as little space as possible. All will be in the english language with scholarly grammatically correct translations and adaptations (and also a latin counterpart for those interested, most of that is already completed). This will take probably another 5 years. The divine office from what was formerly called "synod of milan " (sorry I don't know it's new name) is excellent and recommended. However it is a bit tedious to download all the files for it.